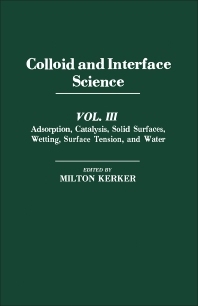 Colloid and Interface Science, Volume III: Adsorption, Catalysis, Solid Surfaces, Wetting, Surface Tension, and Water covers the proceedings of the International Conference on Colloids and Surfaces, held in San Juan, Puerto Rico on June 21-25, 1976. The conference is sponsored jointly by the Division of Colloid and Surface Chemistry of the American Chemical Society and the International Union of Pure and Applied Chemistry in celebration of the 50th Anniversary of the Division and the 50th Colloid and Surface Science Symposium. This volume contains 56 chapters that cover the subjects of adsorption, catalysis, solid surfaces, wetting, surface tension, and water. Other topics discussed include chemisorption; analytical methods for surface analysis; reaction kinetics; polymeric colloid systems; hydrogel-water interface; and the effect of various parameters, such as temperature and pressure. The concluding chapters explore surface and interfacial tension measurement, capillarity, thermal expansion of water, and heat capacity of vicinal water.